Congratulations, you survived the work week and scorching Indian summerheat. Or perhaps you are decompressing after your Burning Man shenanigans on the playa. Well now you&apos;ve got your second wind and itching to hear some tunes on the town, so let&apos;s see what L.A has brewing for ya shall we? Step inside the comfortable candlelit interior of Hemingway&apos;s (appropriately named after the author) filled with old books and type writers. 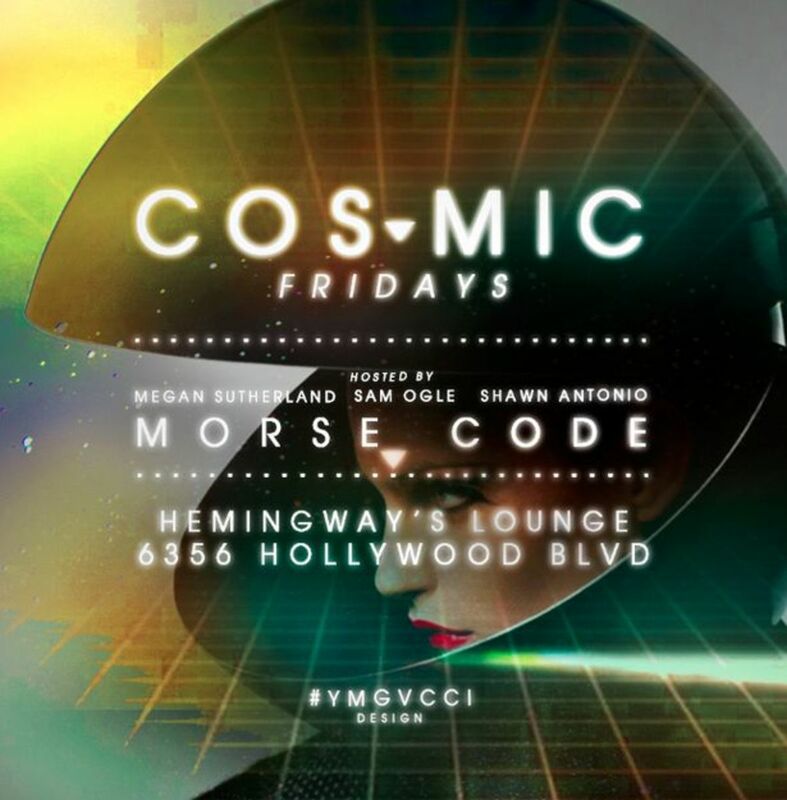 Just don&apos;t get too cozy, because Morse Code will put some pep in your step with his tasty beats and technical mixing. Originally a San Francisco native, Nathaniel Morse was fast to rise on the local scene. Upon releasing a string of classic mixes that earned acclaim from DJ Jazzy Jeff and others, Morse then set his sights on Los Angeles. It was DJ AM who encouraged him to make the move and worked closely to help get him established in LA. He DJ&apos;ed many times at the well known day party destination "Do-Over" in Los Angeles, Miami, and Portland and also won Redbull&apos;s first United States "3style" DJ battle in LA. Hip hop, disco, electro and even pop vibes all mixed with finesse. Free on Fridays by invite only. Consider this a formal invitation ya&apos;ll. Let&apos;s boogie. Signal Flow is made up of Touch of Class founders - PillowTalk member Michael Tello and Ray Zuniga. 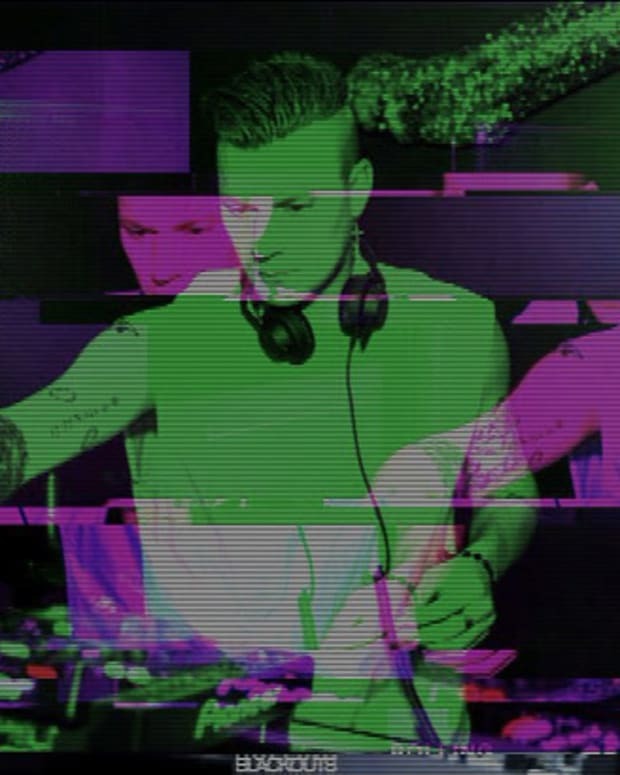 The duo spends their time producing and DJing on the west coast of the US, Berlin and throughout Europe. Co-produced with label mate Jonny Cruz and Aquarius Heaven on vocals, the lead single “DirtyHands” is also featured as a remix produced by Wolf + Lamb newcomer Navid Izadi. Since their premier live performance at their label launch event at the BPM festival, the track has received serious buzz. Aquarius Heaven AKA Brian Brewster, used to spin reggae, dancehall and hip hop but has made his way to the electronic scene. He has releases on Wolf + Lamb, Circus Company and Visionquest. Navid Izadi, an SF transplant DJs, raps, sings and produces. One chic multi-tasker if you ask me! Tracks include collaborations with Soul Clap and Pillow Talk, and EPs lined up for the &apos;crew love&apos; label family (Wolf +Lamb, Soul Clap records, and Double Standard). Jake Patrick had DJ&apos;d almost 15 years and involved with Delinquent Frequency and Music Savages. This guy always plays a mean set guaranteed to please. This party is presented by Harmonic and discount admission is available before 11pm folks! $10 PRESALE TICKETS AVAILABLE FOR A LIMITED TIME. When the $10 presales runout, prices will go up. 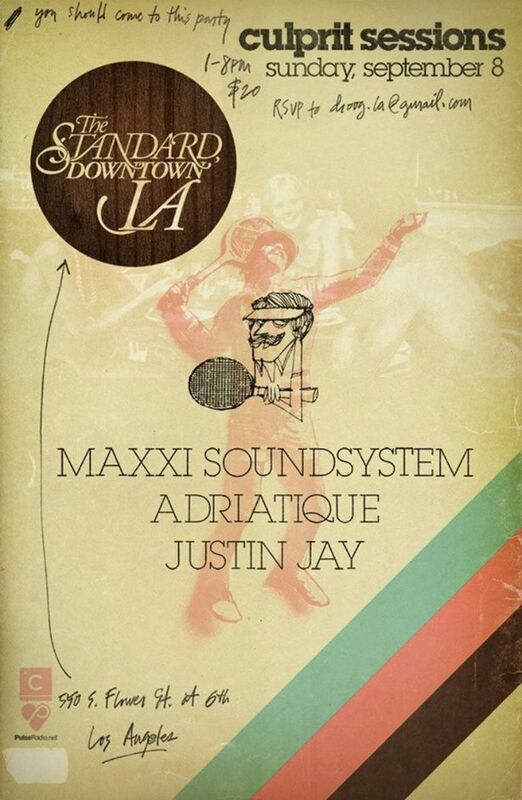 With 84 degree weather on L.A&apos;s destination roof top the Standard Downtown, this Sunday is certainly one not to miss. The 40th edition of the Culprit clan&apos;s raging daytime party offers ear and eye candy from an always killer DJ selection and my favorite view of DTLA. (oh and the crowd is pretty easy on the eyes too. just saying!) 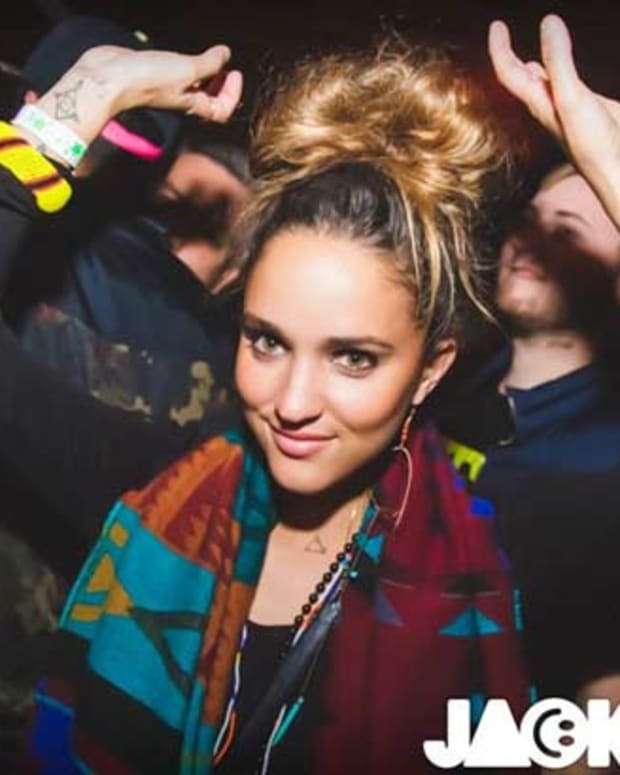 Maxxi Soundsystem is a DJ/Producer/Promoter from Brighton, UK. His success of club hit ‘Criticize’ exploded everywhere at the beginning of 2011 from Annie Mac’s Radio 1 show. Since then he has DJ&apos;d alongside, remixed and collaborated with influential artists such as; Maceo Plex, Danny Daze, Tensnake, Morgan Geist, Aeroplane, Tiefschwarz, Groove Armada and Sasha. Adriatique (Adrian & Adrian) are two guys from Zurich who were born in the mid 80’s when the techno and house community was rising to the top.90’s dance, hip-hop & house stuff influenced one of them. The other half was more into melodic sounds and Europe based techno. On the road as solo artists they met in 2008, found mutual connection with their interpretations and became dj & production partners. Adriatique joined the Culprit crew last year when they released their "Face to Face"EP. Justin Jay may only be 20 years old, but possesses some serious musical talent. Born in Los Angeles, he was enamored with house music at the age of 8 with Daft Punk&apos;s Discovery, after studying classical piano for several years he began DJing and producing. Lines are a given to get into Culprit gatherings guys, so make sure to RSVP and show up early. Remember to lather up that SPF and no song requests ever, please and thank you. Cheers!